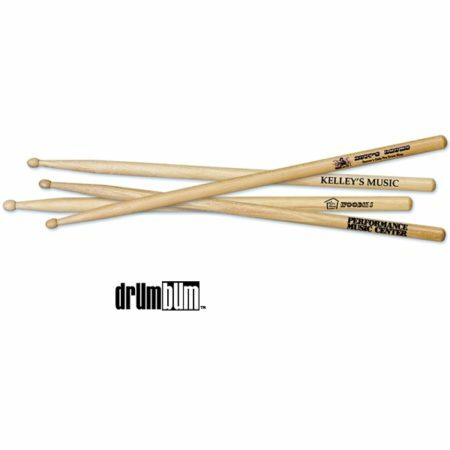 Custom Imprinted Drumsticks – If you’re in the market for professional-quality drumsticks with your name, store or company brand on them, these are the best on the market! This listing is for 36 Pair of absolute top quality, hickory drumsticks printed in black ink. Sticks are size 5A and have wood tips. – Upon placing your order, we will send you an e-mail request for artwork (see below for specifications and turnaround time). *We offer discounting on quantities of 100, 250 and 500 pair. Also, we also offer several other custom drumstick printing options including low-cost promotional drumsticks, colored drumsticks and full wrap color printing. Contact us for more information.